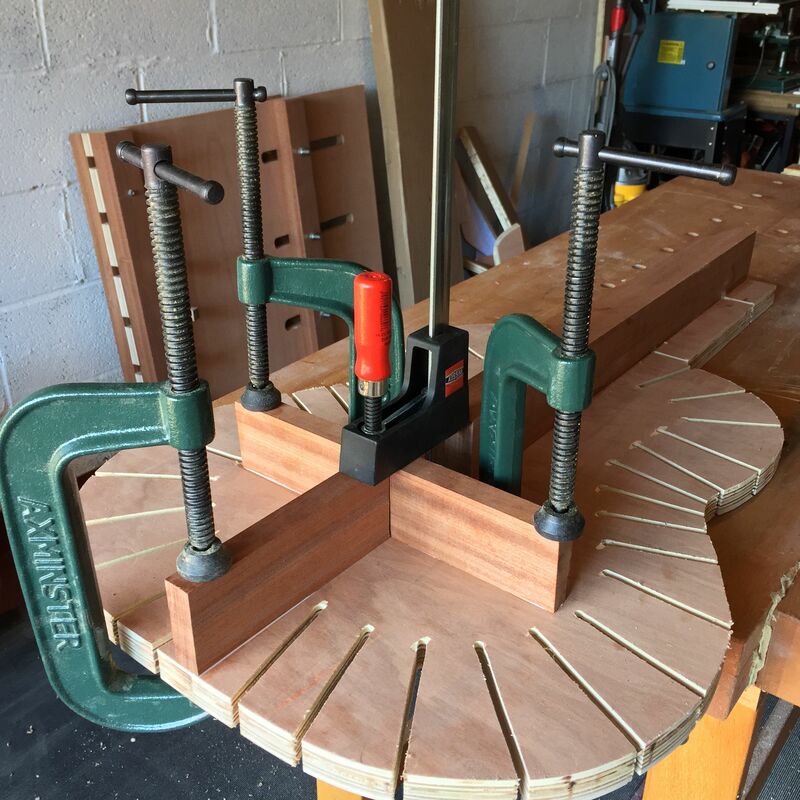 Having built a new version of my soundboard gluing jig (as featured in this month’s issue of Furniture & Cabinetmaking) over the May bank holiday weekend, I thought I would take the opportunity to built a new solera as well. For the uninitiated, a solera is the form used traditionally when building acoustic guitars, particularly when assembling the body. 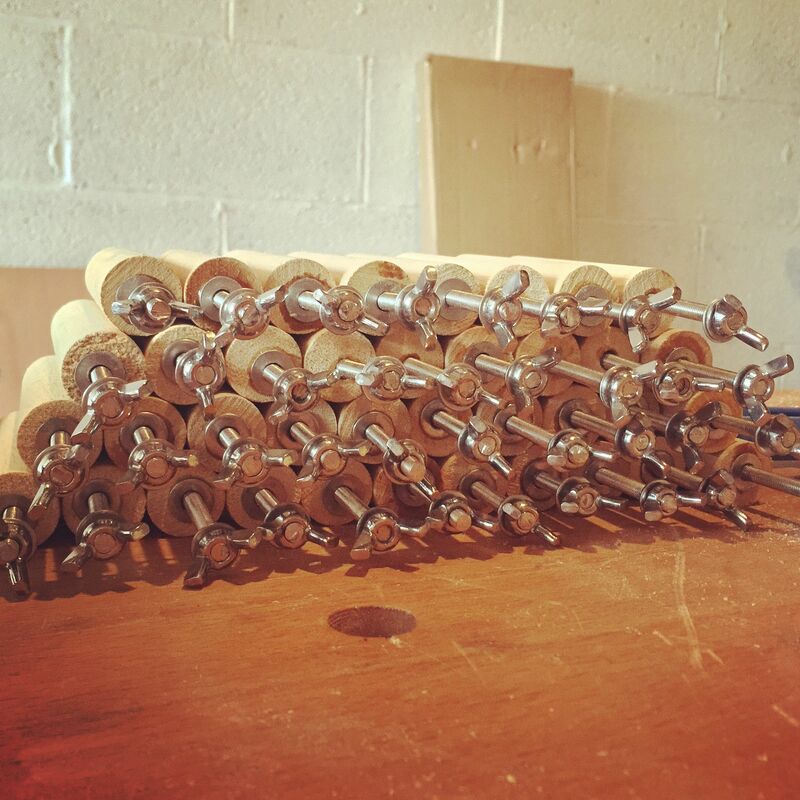 I try to avoid relying on too many jigs, as I prefer to spend my time building instruments or furniture, instead of building things I need to build things, and being hand tool focused has certainly assisted in jig-avoidance. Storing a large number of jigs is also something I would rather avoid. For this reason my workflow requires relatively few jigs. 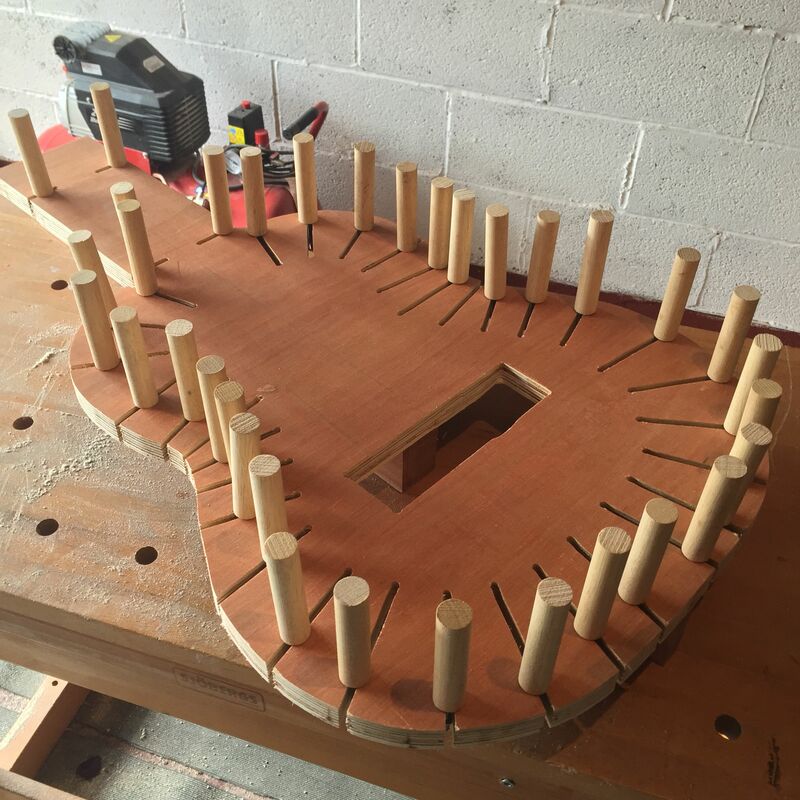 Equally, instead of using fixed moulds for each acoustic guitar body shape, my solera is adjustable for any body shape from the current parlour guitar build right up to a super-jumbo body size. This means that I don’t have to build a new mould every time I build a guitar of a different size or shape (which would add to the build time and quickly eat away at available workshop space). This design of solera, which is the same we used at Totnes, consists of a deck of 25mm thick plywood, with thirty two 6mm thick slots cut from the edge in towards the centre of the deck. 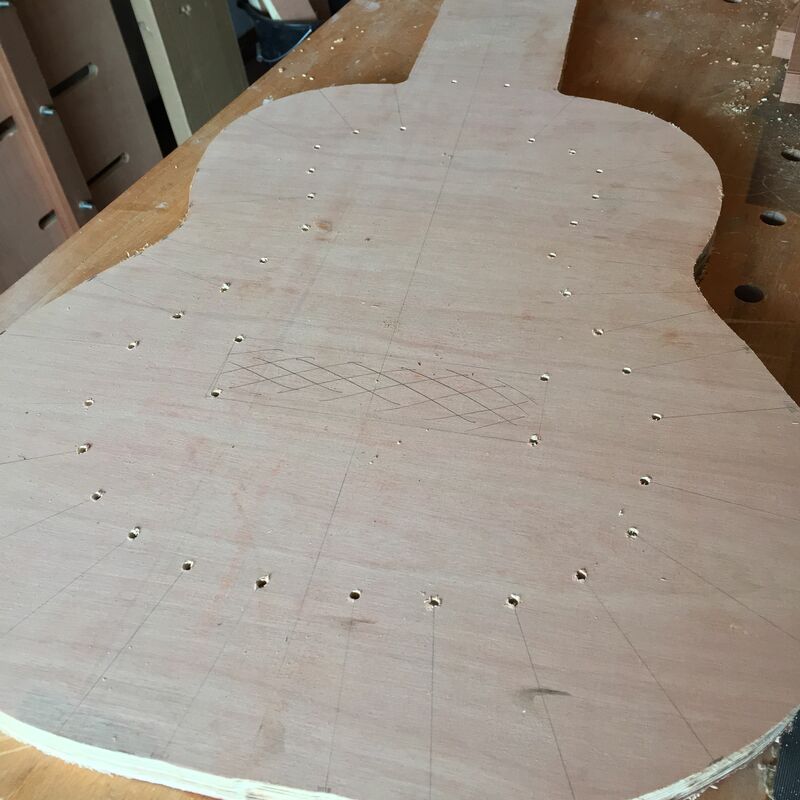 The shape of the guitar is set by 22mm diameter dowel posts with 5mm thick threaded steel rod set in one end. The steel rod slides in the slots in the deck, and the posts are secured in place by wing nuts underneath the deck. Although this wasn’t the most thrilling build, it was a useful insight into the power tool woodworker’s world, as I had to build a couple of templates in order to build the jig (in order to build more guitars…). First up was a template so that I could route the deck to shape. I found a friendly reprographics shop who could copy my drawing of the solera at full size, and glued one of the copies to a sheet of 5mm thick MDF. The MDF was cut to shape using a jigsaw, and the shape refined with sandpaper and files. The deck, cut to shape, with slot position and the bridge recess marked out. I then clamped the MDF template to the plywood, and using a 25mm router bit in a template collar, cut the deck to shape, again followed by some cleaning up with sandpaper. With the deck shape finalised, I marked the inner end of each slot by drilling through the plan glued to the MDF template into the deck. Before I could turn to routing the slots, I made a simple template to guide the router, out of a piece of scrap pine. The template simply consisted of a straight slot wide enough for my router’s template collar. 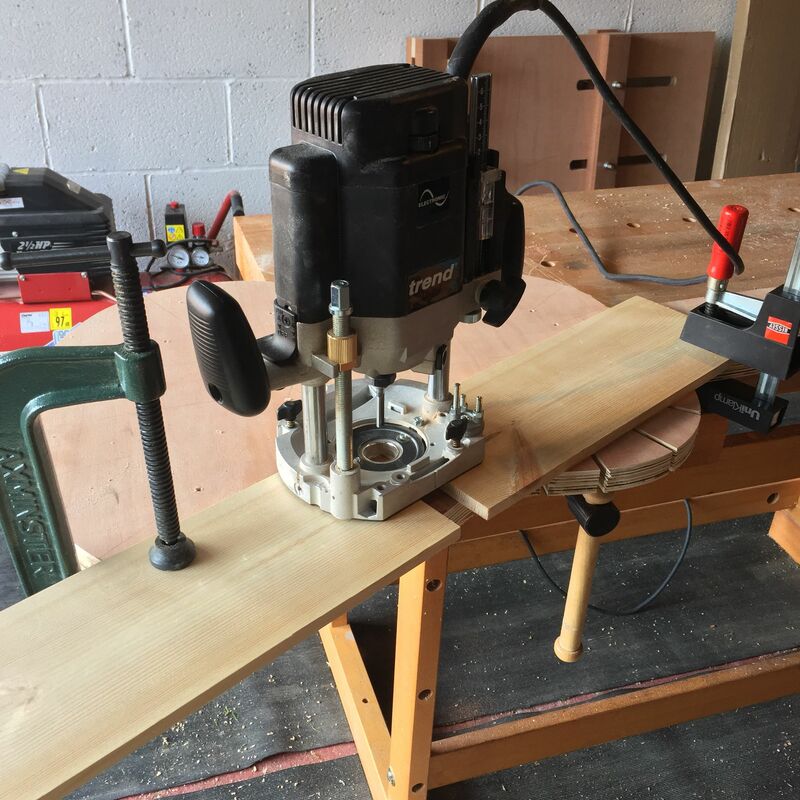 The deck was clamped to the workbench and the template moved round the deck so that the router would cut each slot marked by the earlier drill hole to full depth. The recess for the guitar bridge was also routed out at the same time (guitars are assembled face down in the solera). Having routed all 32 slots, I then prepared and glued the feet to the underside of the deck. The feet are in three sections. A 50mm square piece of hardwood runs from the end of the solera to the front edge of the bridge recess. At the rear of the bridge recess is a cross piece of 50mm x 20mm of hardwood running along the width of the solera (positioned so that access to none of the slots is fouled) and a further piece of hardwood running lengthways from the cross member to the end of the solera. This arrangement is sufficient to keep things stable, and high enough off the deck for the steel rod to feed through the deck. Gluing the feet in position. As a final touch, I gave the deck a couple of coats of shellac to make wiping up any glue easier, and to provide some basic protection (I don’t intend to make another one of these for a couple of years). Then it was on to the posts. Cutting 40 posts (I wanted to have a couple of spares on hand) by hand would have been quite dull, and as this was already turning into a power tool powered build I cut the posts on the bandsaw in only a couple of minutes, using a piece of blue painter’s tape on the table to mark the correct length (90mm long). 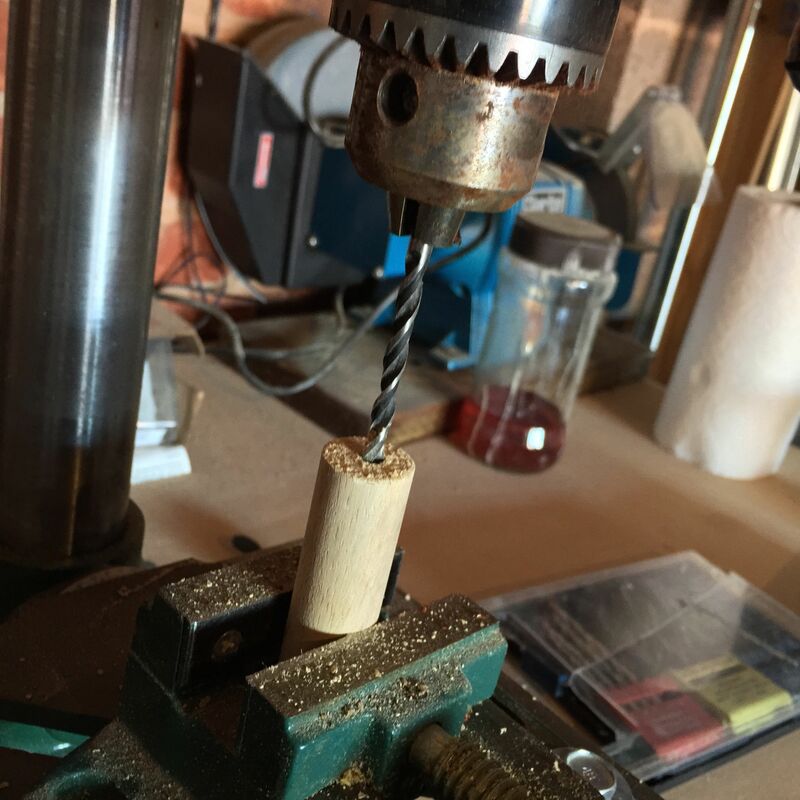 Similarly I drilled the slots for the steel rod on the drill press. The full set of posts glued up. Cutting the steel rod to length was one of the most time consuming operations for this build, as I resorted to a Kieran-powered hacksaw. With the rod cut to length I glued them in to the posts with epoxy, and then threaded two washers and a wing nut onto each. The solera is now complete, and I am looking forward to pressing it into use on the parlour guitar build (and many other guitars after that). All in all it took two and a half days to build, although I’m sure that someone who is more familiar with power tools could have shaved some time off that. That has to be my most power tool heavy post to date. But don’t worry, because my next string of blog posts will be entirely hand tool focused. This entry was posted in Lutherie by overthewireless. Bookmark the permalink. Great description of the build. In my experience of building jigs to build guitars I have found so many jigs built by resourceful folks who don’t think to detail the process for the rest of us which eats up alot of time re-inventing the wheel. Having this detailed walk through is going to help a lot of aspiring luthiers! Thanks James! Despite my grumbling about all the power tools, there is nothing complicated about this build donuts perfectly within the grasp of beginners. And having the flexibility of a single form means that you can experiment with as many body sizes and shapes as you can think of. Later in the parlour guitar build I’ll show how using the solera makes carving the neck easier, and how you can use it when stoning frets and setting up a finished guitar. So stay tuned for more!